International Development Secretary Justine Greening today announced new support for specialist units in the Metropolitan Police, City of London Police, the Crown Prosecution Service and the Serious Organised Crime Agency. The additional support will allow these agencies to continue to stop foreign or UK criminals from benefitting from corrupt practices in developing countries. Britain has also established a new taskforce of UK legal and investigative experts to help recover stolen assets across the Middle East. This follows the Prime Minister’s announcement that transparency and accountability would be a key priority at this year’s G8 summit. When corruption happens in developing countries, it is the very poorest people in our world who foot the bill. Corruption is a deadweight which is holding countries and their people back. The UK government will not only work in countries to prevent public funds from being siphoned off or stolen - we will step up our efforts to combat corruption that uses our shores as a host. DFID’s ongoing support is enabling the City of London Police’s Overseas Anti-Corruption Unit (OACU) to investigate and prosecute some of the most complex and significant cases of overseas bribery and corruption. The move comes as - for the first time - the Department for International Development (DFID) publishes specific plans to tackle the misuse of foreign public funds in each of its 29 priority countries. This will help the poorest people to develop their economies, hold their own governments to account and to grow their way out of poverty. Metropolitan Police’s Proceeds of Corruption Unit to investigate allegations of corrupt foreign politicians or officials laundering money through the UK. Since UK aid funding started the unit there have been eight successful prosecutions and over £100 million has been identified and is being recovered or held pending investigation. City of London Police’s Overseas Anti-Corruption Unit to investigate allegations of UK citizens and companies involved in overseas corruption, especially foreign bribery. To date, the Unit has charged 27 people and one company, successfully prosecuted 13 individuals and 20 cases are currently under investigation. Serious Organised Crime Agency to develop better intelligence which can be used to inform future investigations. Crown Prosecution** **Service for asset recovery in the UK by issuing confiscation orders and preparing for the eventual return of stolen funds to the country of origin. Innovative technology - use of mobile phones in Pakistan to transfer money to girls to help them go to school and avoid it being stolen; use of GPS satellites to track textbooks in South Sudan to ensure they reach their destination; and the introduction of online automated tax and government services in Bangladesh which are less open to abuse. Seizing stolen assets - Britain has extended support for Caribbean investigators who seize assets gained from corruption or drug trafficking across the region. Since 2010, a major regional drug trafficker has been prosecuted and £8 million worth of assets have been forfeited, seized or are under restraint. New laws - helping Mozambique to implement its new law on public probity which includes specific measures to tackle corruption. Local police - supporting local police and farmers in Malawi to monitor seed and fertiliser distribution and arrest any corrupt officials. Train local media - building a strong free press in Nepal to root out corruption and hold institutions to account. 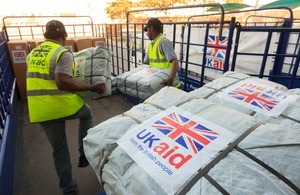 Britain’s own aid funds are subject to strict checks to safeguard spending and prevent fraud. The Department for International Development has a dedicated Counter Fraud Unit to investigate allegations of misuse of aid money.